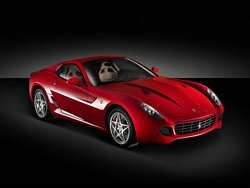 (Source Ferrari Press ) With the release of the 599 GTB Ferrari is presenting its most powerful V12-engined production car of all time. Amedeo Felisa, Ferrari's Vice General Manager will announce today at the Detroit Motor Show the birth of the latest model developed in Maranello. The new car is a concentration of Ferrari's most innovative and technologically advanced engineering solutions applied to a mid-front engined two-seater coupé. The result is a new benchmark for performance, driver involvement and design. The Ferrari 599 GTB boasts class-leading power thanks to its 5,999cc V12 - derived directly from the Enzo Ferrari supercar - which produces no less than 620hp at 7,600 rpm for a weight/power ratio of just 2.6 kg per horsepower. Acceleration 0-62 mph 3.7 sec. Ferrari has adopted the latest evolution in its tried and tested all-aluminium construction technology for the body and chassis. The unmistakable Pininfarina design gives the Ferrari 559 GTB aggressive yet elegant lines which are perfectly integrated with the advanced aerodynamic solutions adopted to reach the performance figures attainable. This new model is the symbol of Ferrari's production - the V12 berlinetta - and represents the latest interpretation of a theme that has seen such classics as the 250 GT, the 275 GTB, and the 365 GTB4. The Ferrari 599 GTB replaces the last in that great line of berlinettas, the 575M Maranello, of which - together with the 550 Maranello introduced in 1996 - no fewer than 5,700 have been produced, a record for this type of model for the Prancing Horse.